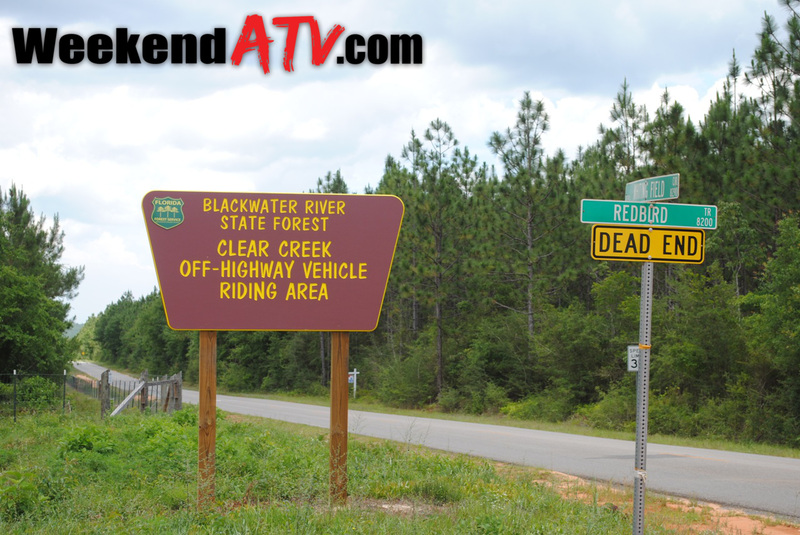 On the south-west border of Florida’s state capital of Tallahassee sits one of the states largest National Forests, Apalachicola National Forest. 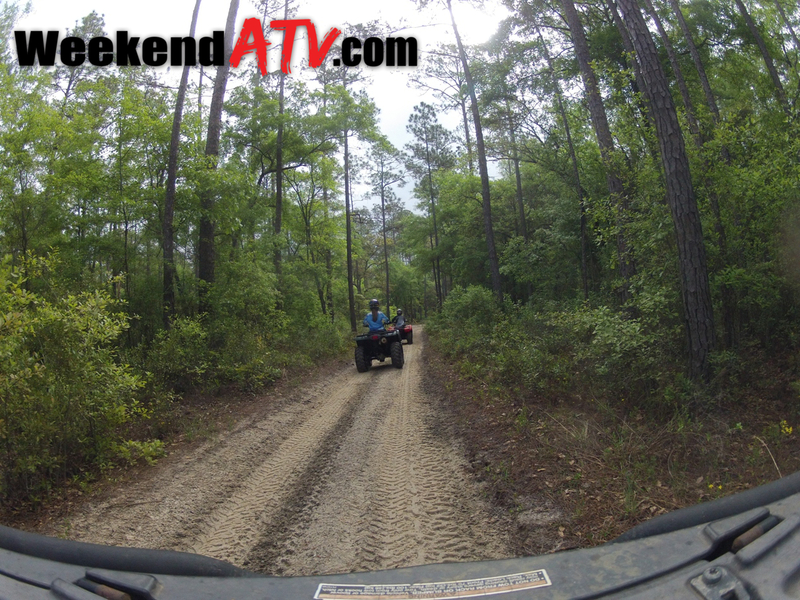 Florida has always been a haven for off-roaders and Apalachicola National Forest is a prime example. 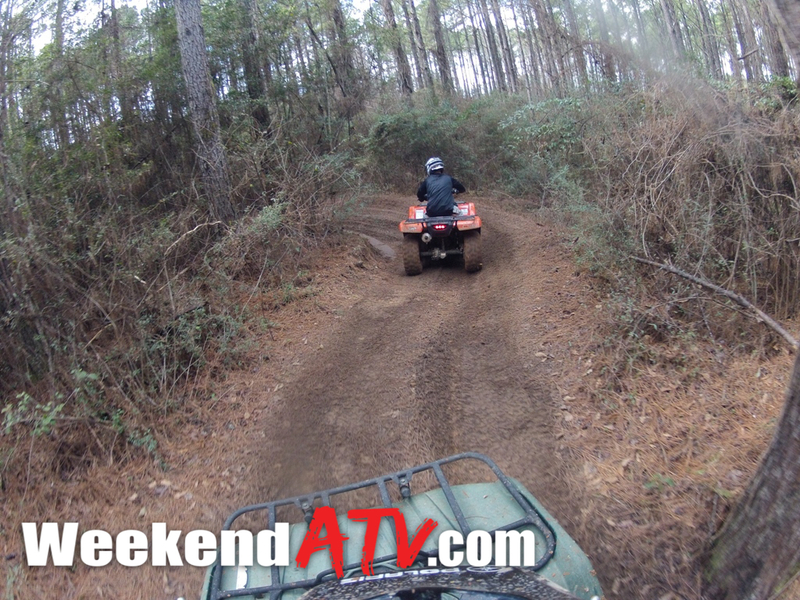 It is home to 56 miles of ATV, single track and automobile trails over several types of terrain. 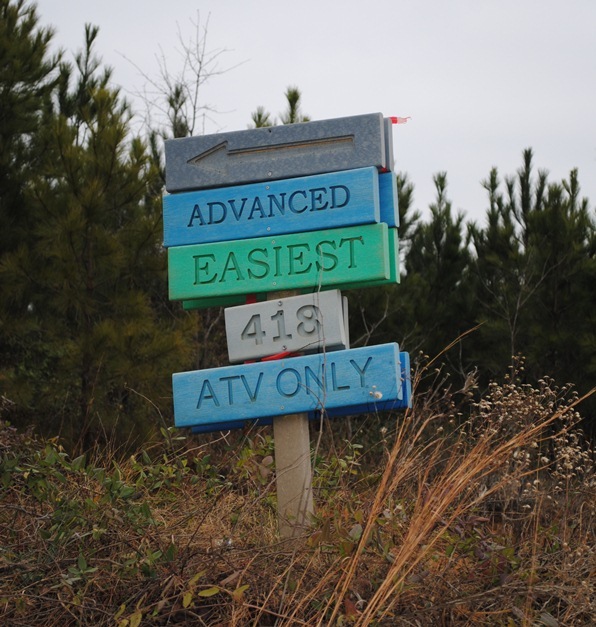 There are three trailheads for ATV enthusiasts. Two are dirt parking lots off dirt roads. 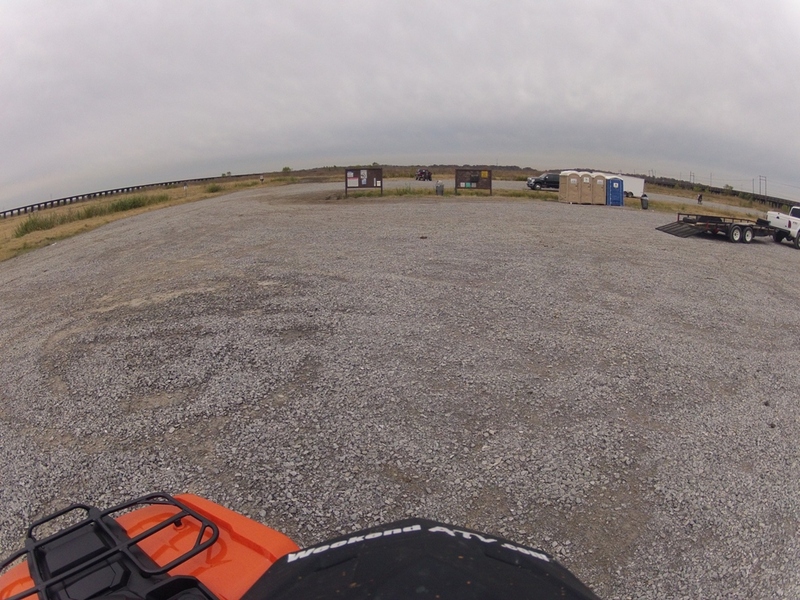 But the Silver Lake trailhead at the Silver Lake Recreational Area is a great launching point. For a $3 use fee you can pull into paved parking lots with plenty of room for trailers. Surrounding you is the swimming area of Silver Lake and a bathhouse as well as grilling areas. 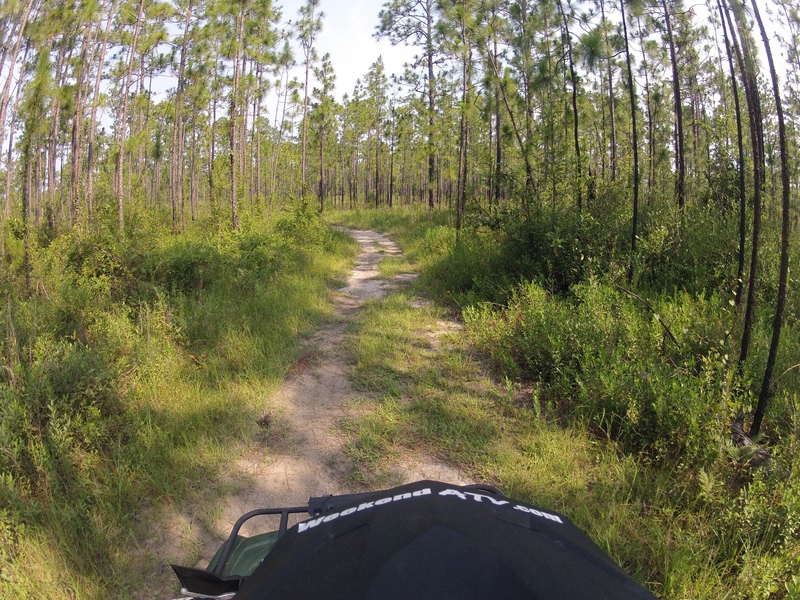 Riding fees are $10 per rider for a 3-day pass good for most of the National Forest trails in Florida. $75 will get you an annual trail pass. 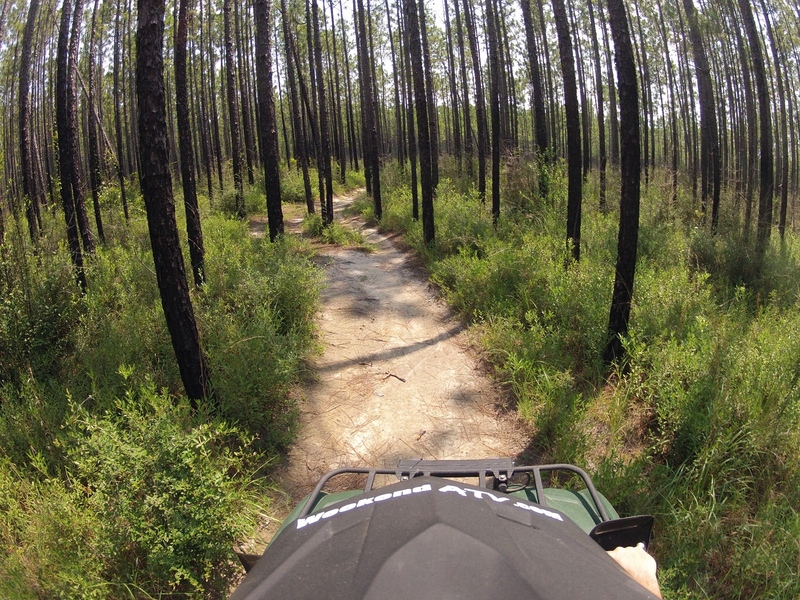 Hitting the trails you may immediately wonder if you need sand paddles. 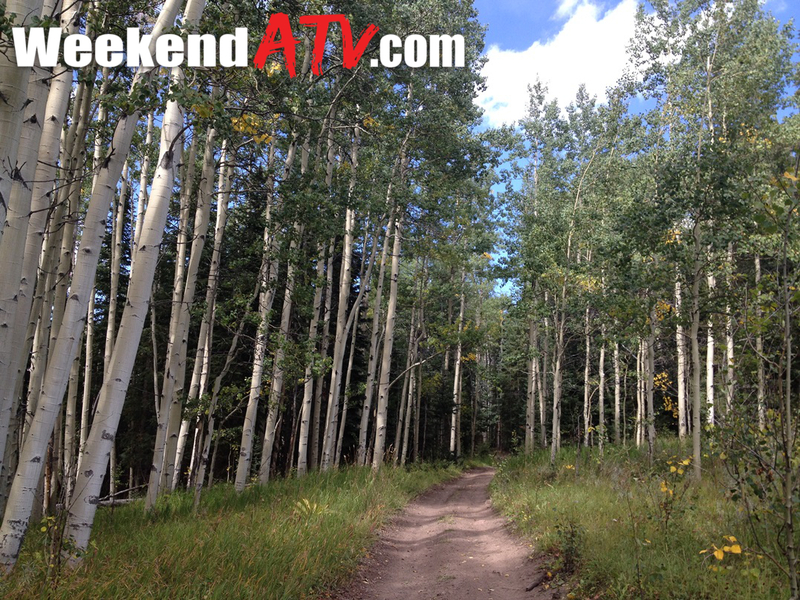 The trails start off with very soft, white sand and may concern you about getting stuck. 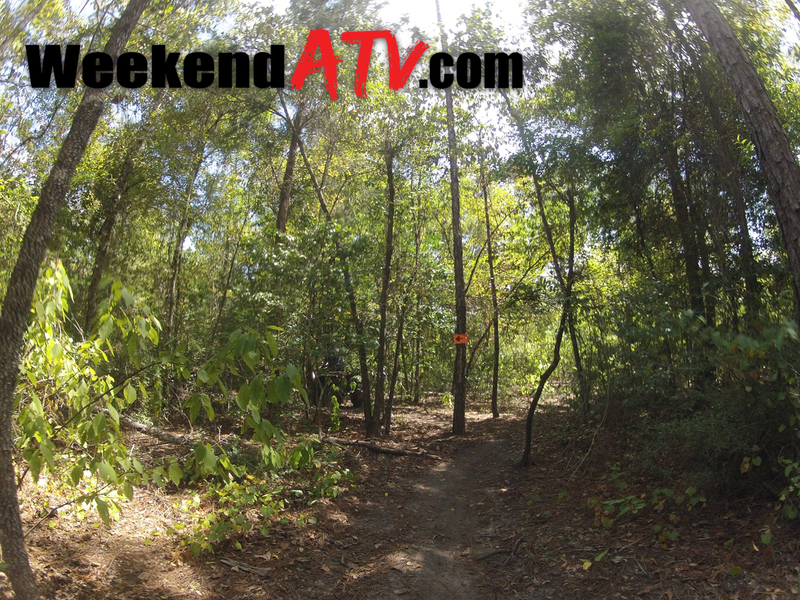 The softness of the sand fluctuates throughout the trails but we never had any struggles from it. The trails are all clear and wide. They are also pretty clearly marked with forestry road numbers. 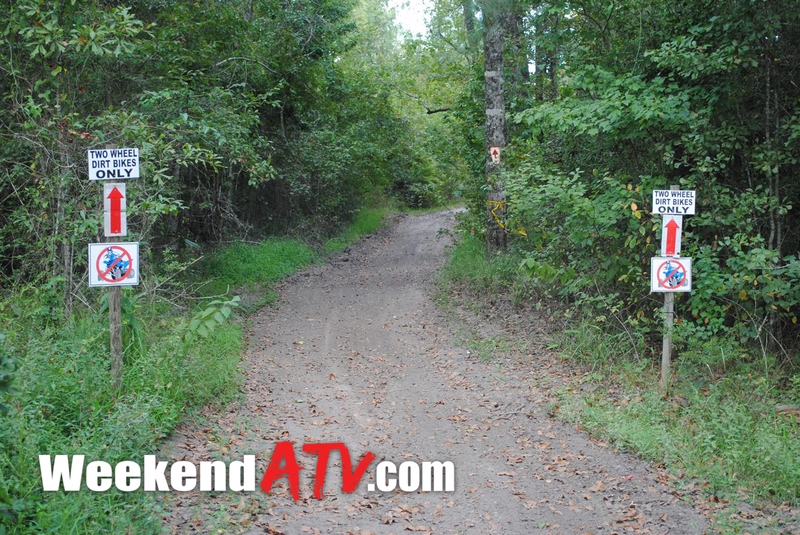 The trails cut in and out of automobile forestry roads and each of the ORV trails are clearly marked for what types of vehicles are allowed. 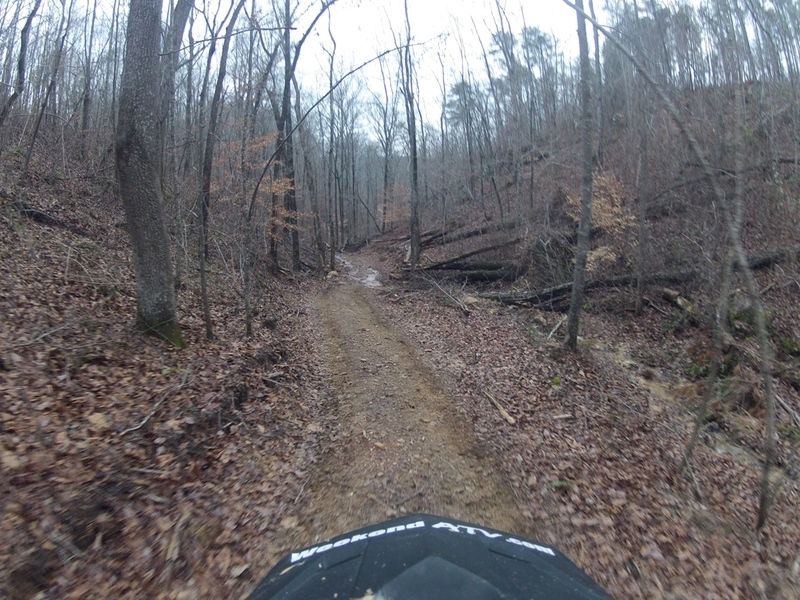 The trails aren’t all about sand. 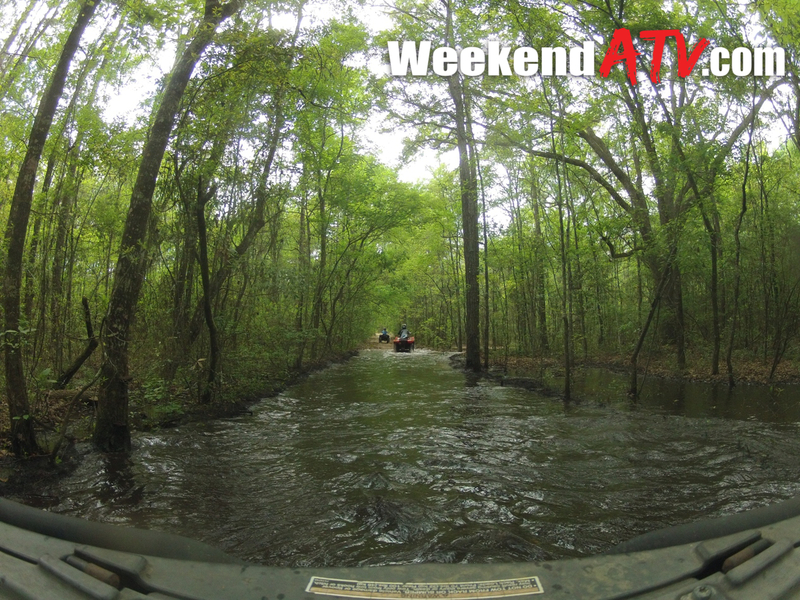 There are several water crossings and deep water holes. 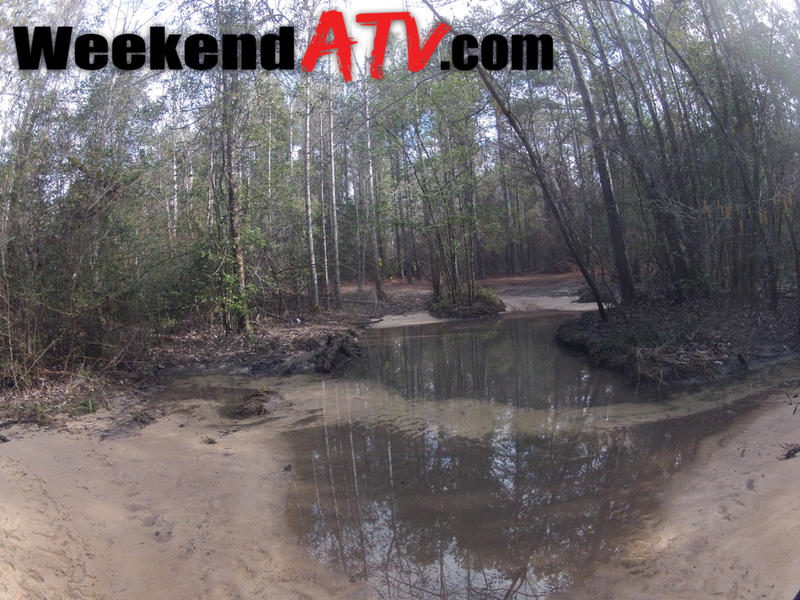 Most of the water holes have bypass trails cut around them or have a rock base. 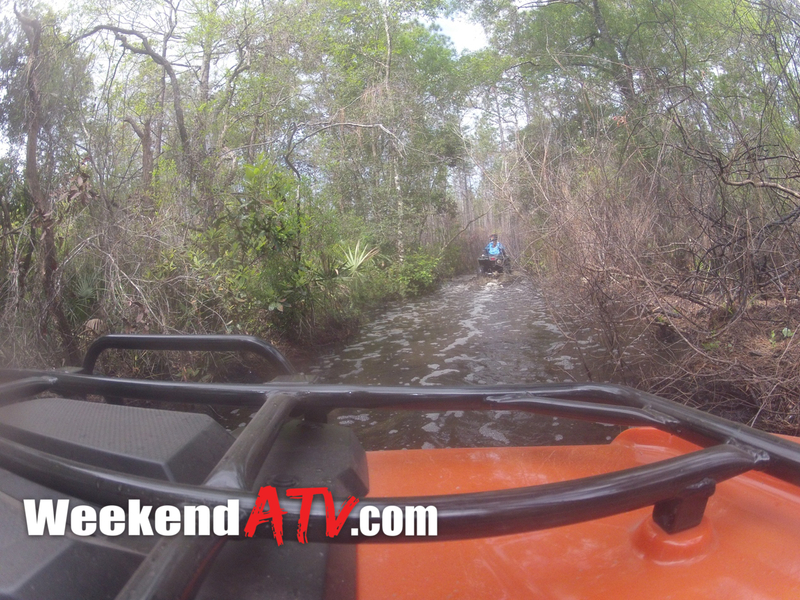 The holes were fine for even stock ATVs but we did bottom out on one and have to practice our recovery methods. 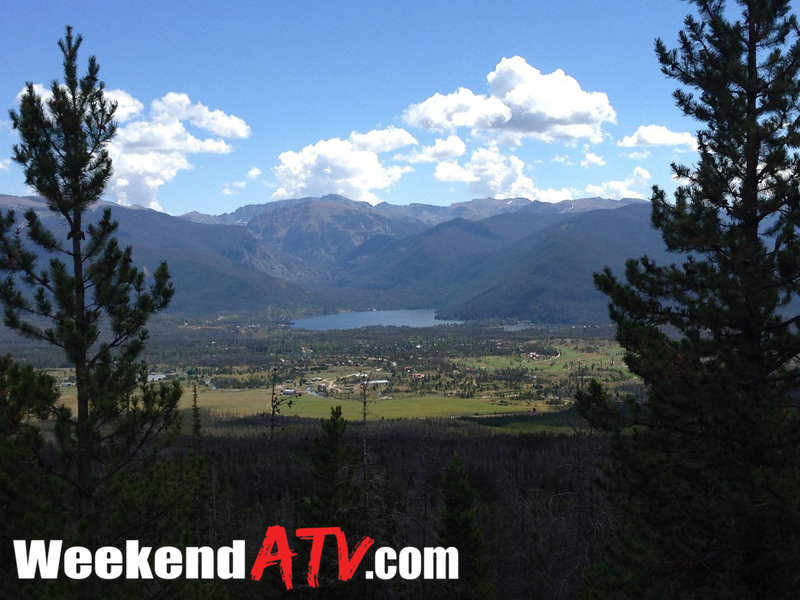 While generally a flat landscape the scenery changes regularly. Patches of tall pines with a lush fern floor disappear fade to small hardwoods with thick underbrush and then to few trees with shrubbery growing in swamp like conditions. 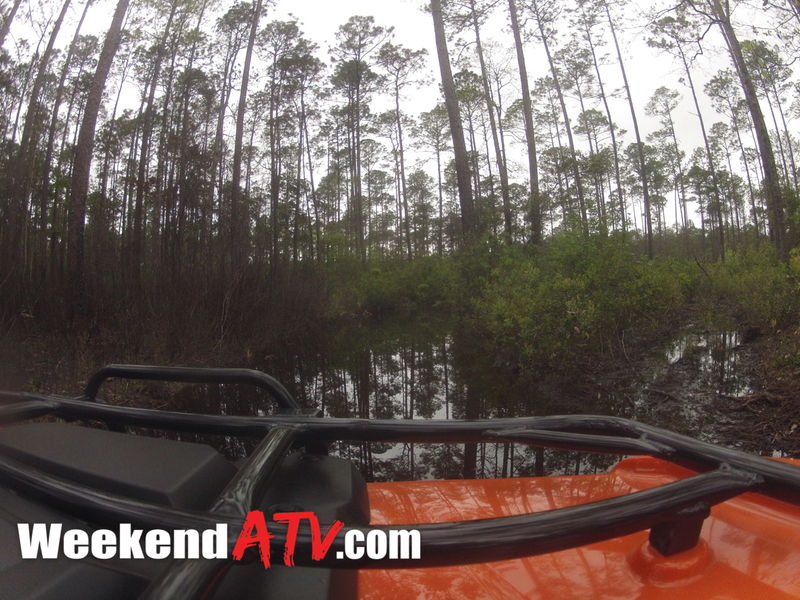 At times you can’t even see a trail, just a submerged clearing, curving through the bushes. Life Beyond the Pavement. 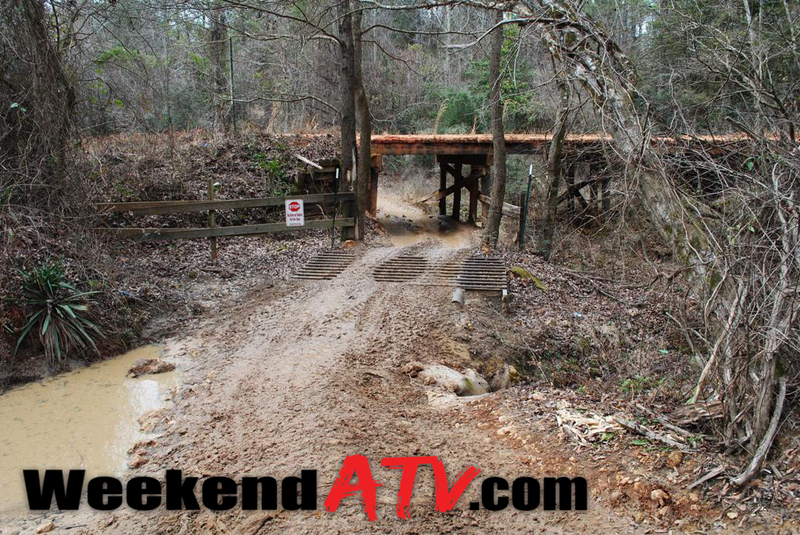 That’s what Boggs and Boulders Off Road Adventure Park refers to itself as, and perhaps there are few truer statements. 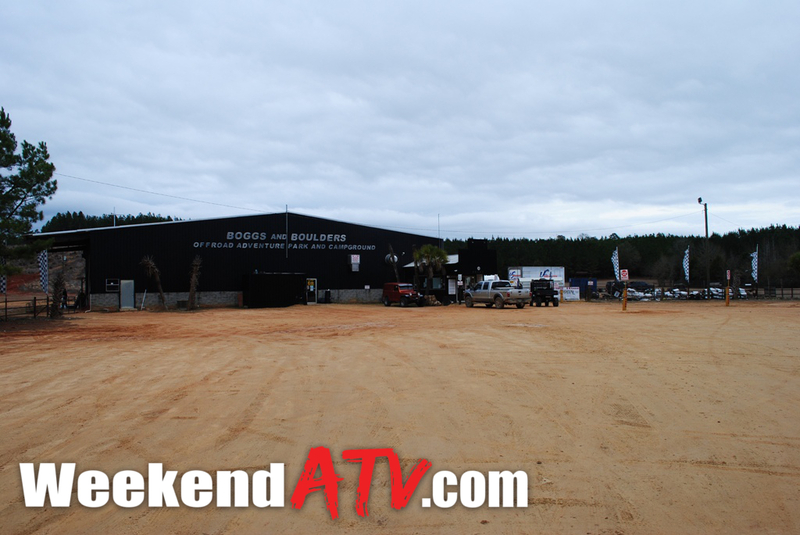 Boggs & Boulders is remotely located in the community of Brooklyn, Alabama. 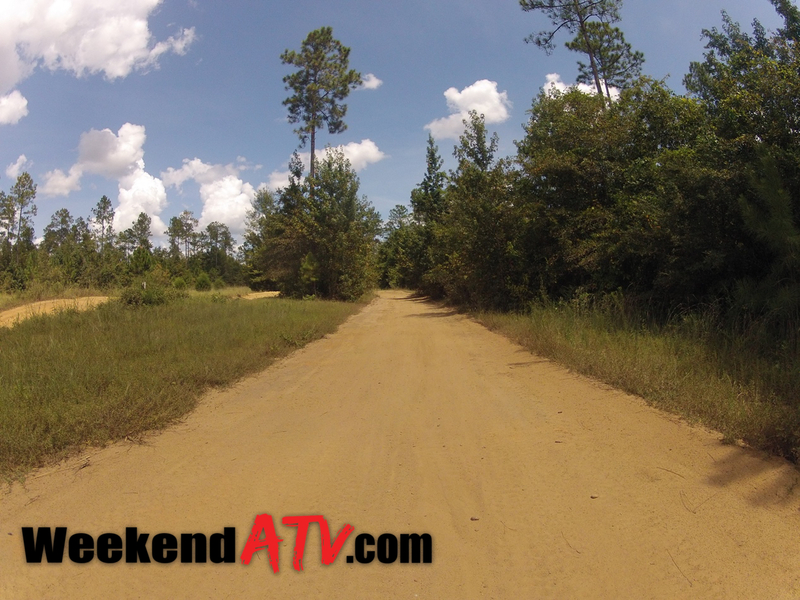 But when you turn off Brooklyn Road into the entrance you leave the pavement behind and enter an off-road paradise. 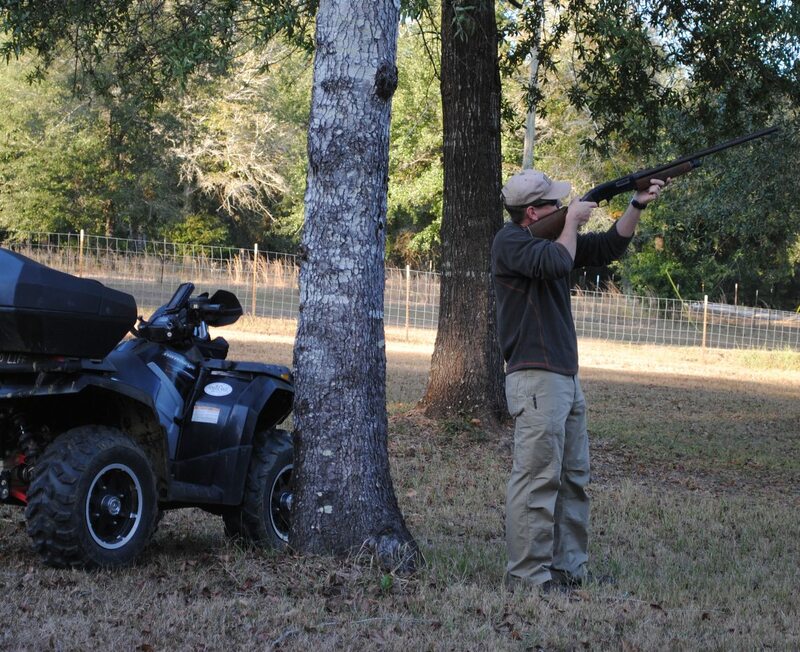 Boggs & Boulders caters to almost every conceivable type of off-road vehicle. 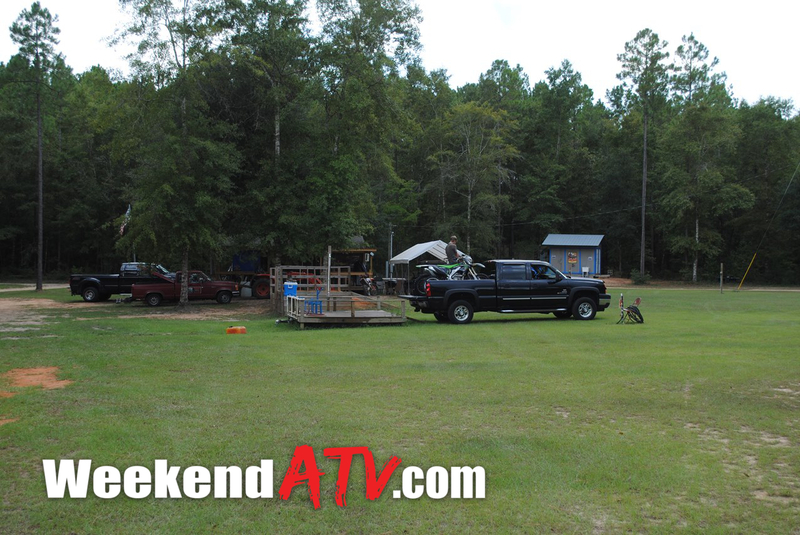 They welcome dirt bikes, ATVs, UTVs, Jeeps, mud buggies, rock crawlers and most anything else. You’re even welcome to hike or mountain climb on the rock walls. And with over 1,000 acres this playground has plenty of room for everyone. The park has main roads that get you to the various areas of the park easily. 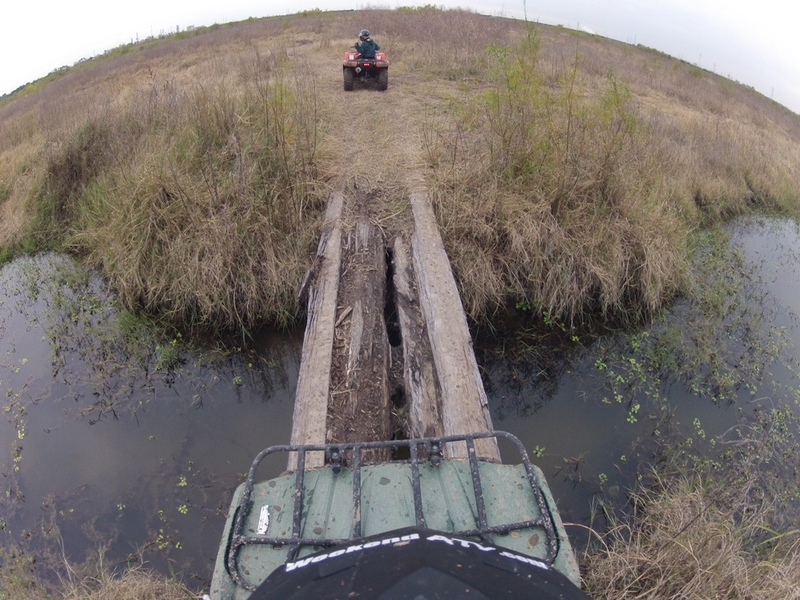 From there trails of all sizes and types go in different directions. 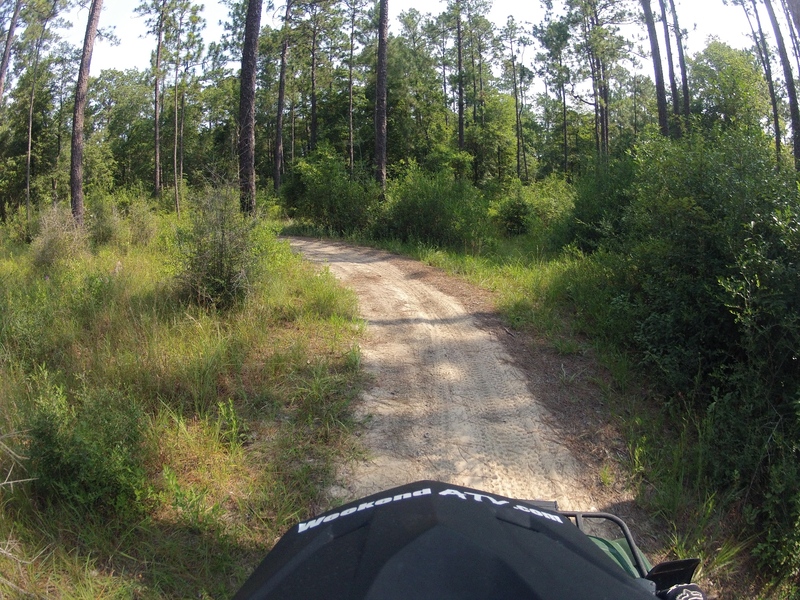 Many trails are limited to certain vehicles types because of the trail width. Those trails are clearly marked. Our visit was the week of a very rare snow fall which had melted and made for a pretty muddy park. 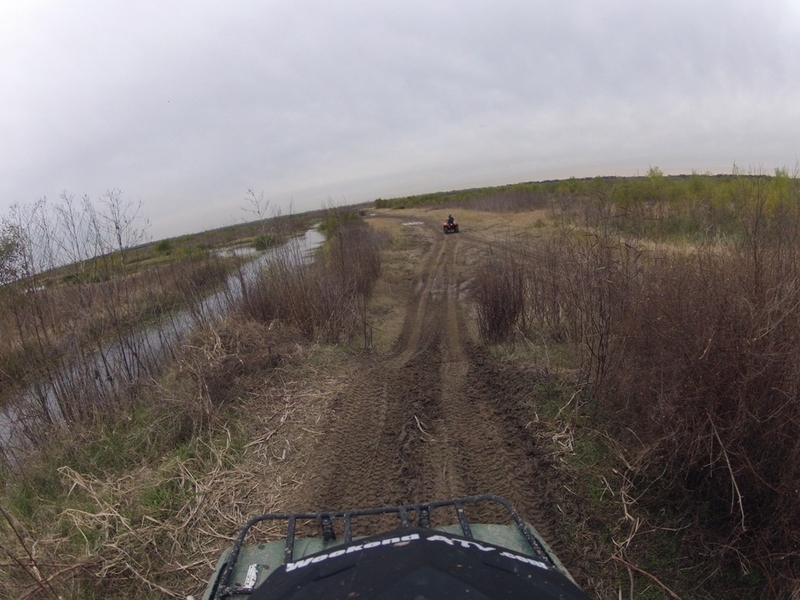 However, the rocky soil meant we usually had plenty of traction. 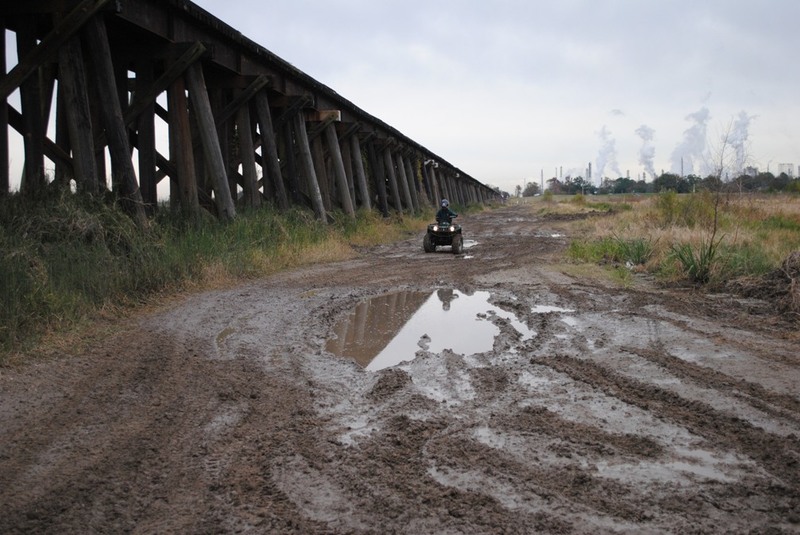 If you aren’t up to testing the depth of the mud there are dry detours in most cases. 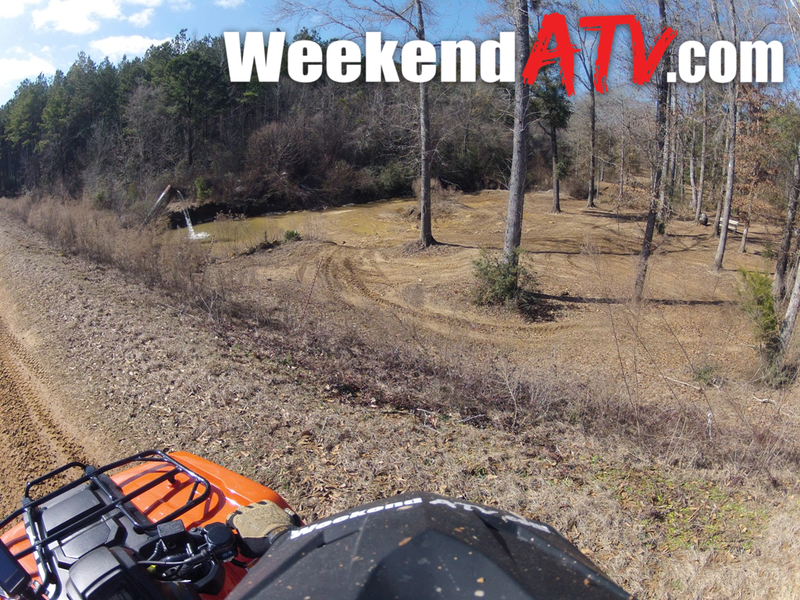 With the exception of a few dedicated mud holes any stock ATV should do fine at Boggs and Boulders. 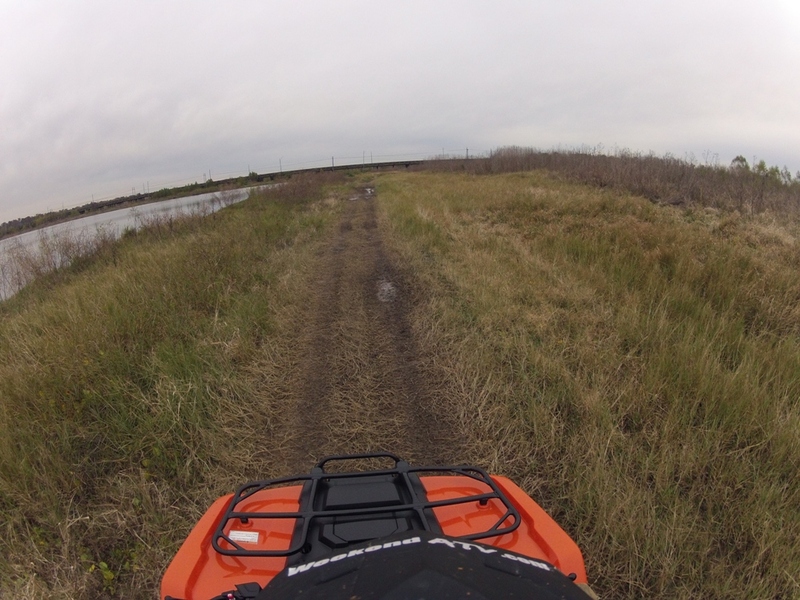 We actually witnessed a young female pilot a Polaris RZR 170 impressively through very muddy trails. 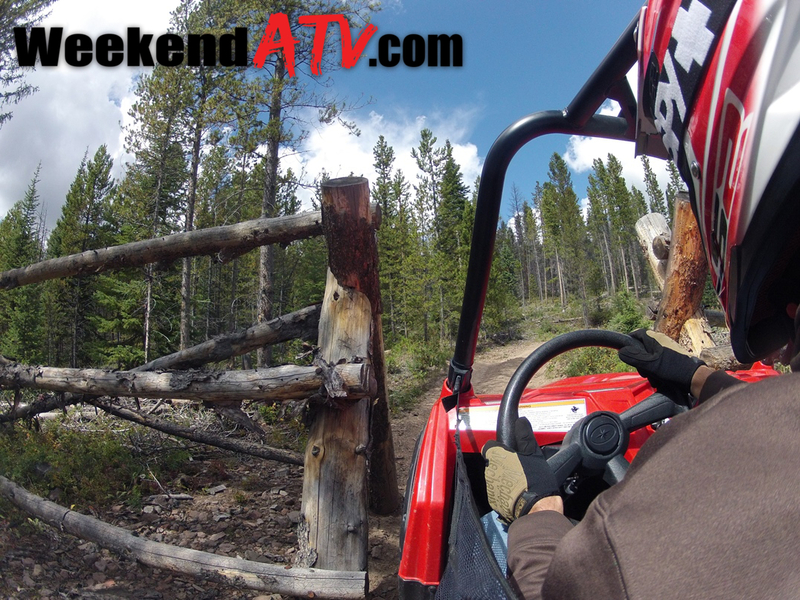 Whether it was her driving or the RZR itself she had no trouble guiding the little side-by-side through the thick of it. I fully expected to be pushing her out at somepoint. 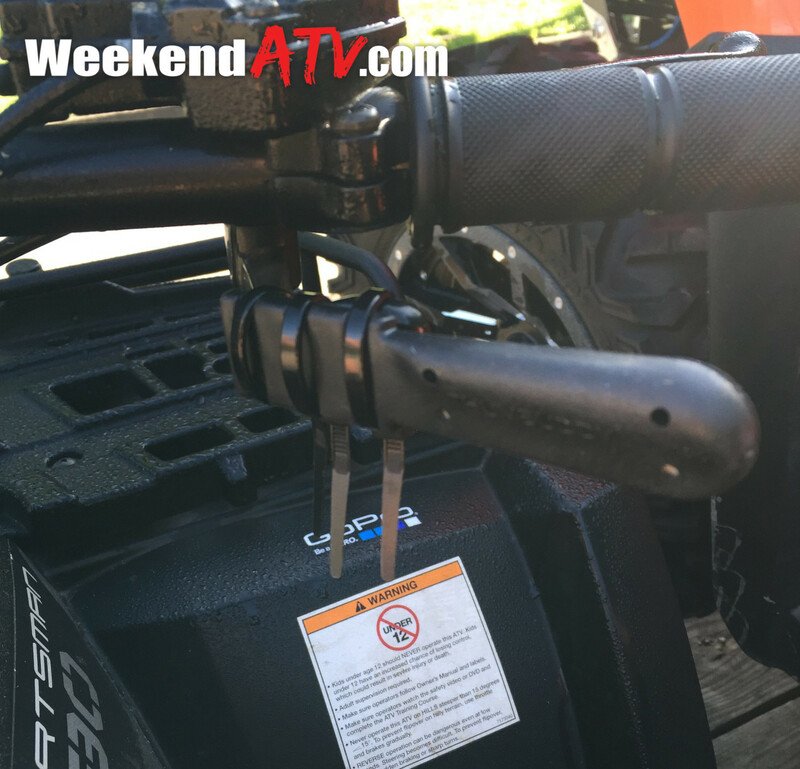 After seeing that you can be confident that your ride will have no problem. One day is not enough to fully enjoy Boggs and Boulders. 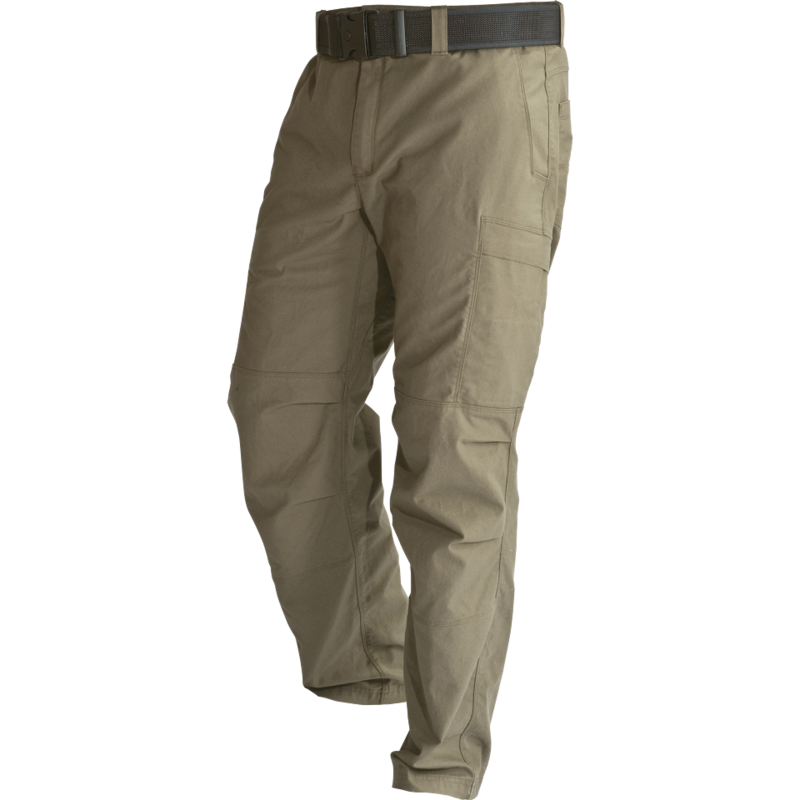 The staff is very aware of that and have set up multiple options to keep you comfortable overnight. 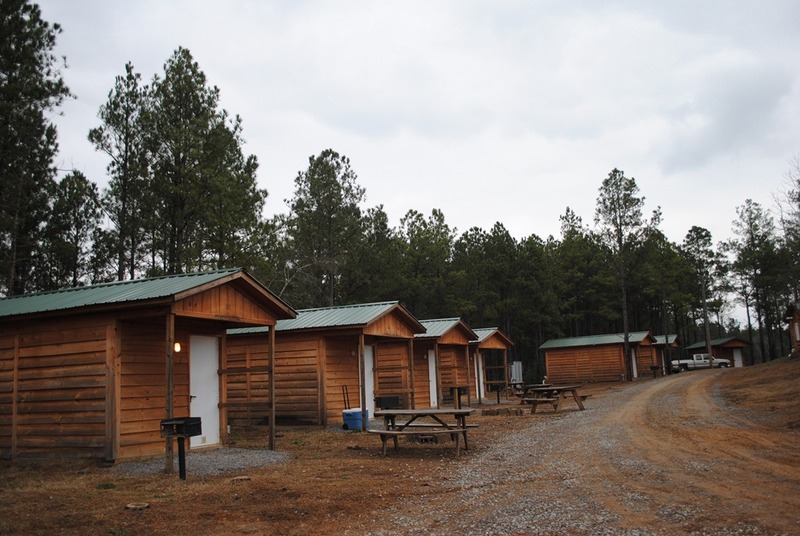 There are several cabins, A-frame bunkhouses and campers available for groups of any size. 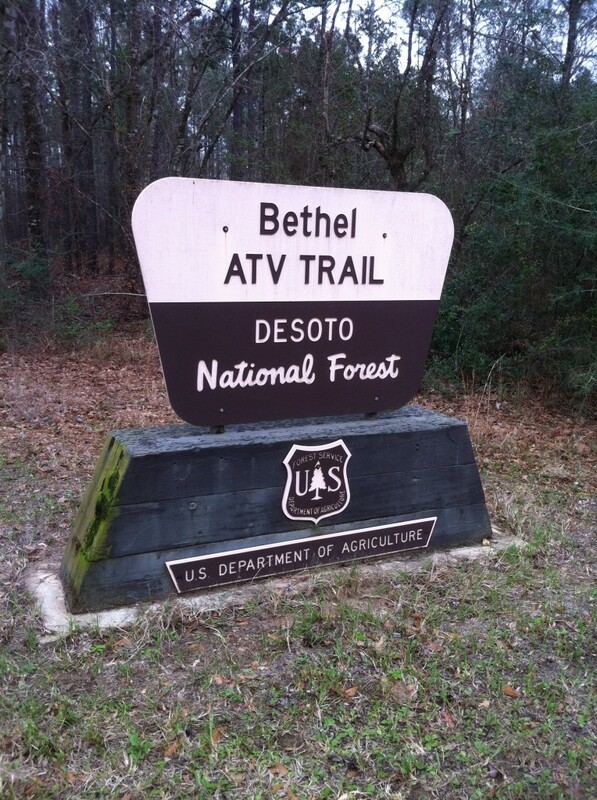 There are also over 100 RV sites and primitive camping areas. Some of these options have restroom facilities. For the others it’s a short ride to the bathhouse which is one of the better facilities we’ve come across. Hotels are located in the nearby city of Andalusia, Alabama. After a long day of riding there is a very large spring-fed swimming hole with a beach and areas to relax and play. 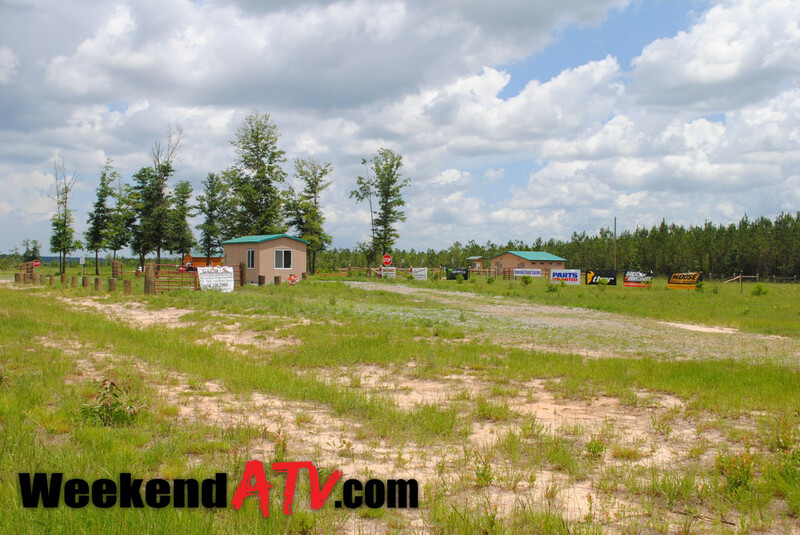 There are also a couple of caves to explore on the acreage and a few group areas that you can reserve for your friends. The Mud Pie Cafe serves up a great selection of food from the grill with indoor and covered outdoor seating. The pavilion also has a stage and regularly hosts concerts and events; be sure to check out the events on their website. 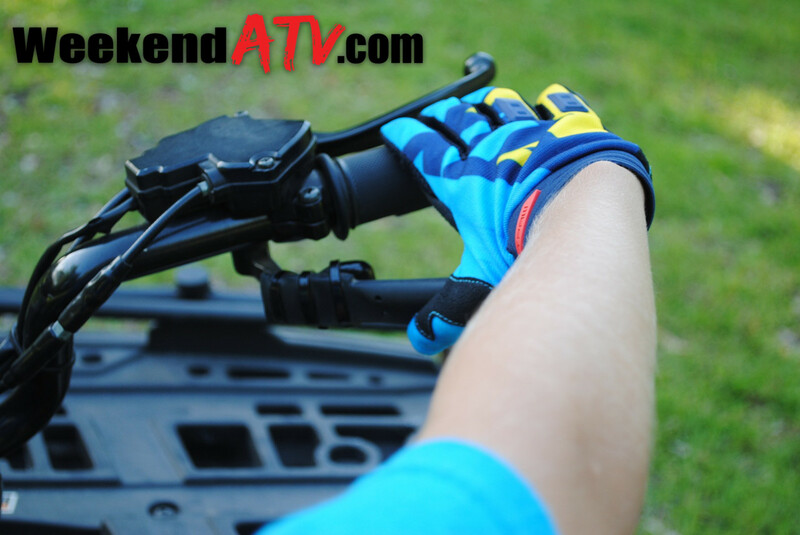 The store has hundreds of accessories and replacement parts for ATVs and UTVs as well as RV parts. There’s also a multi-station bike wash to quickly relieve your ride of any mud you collect on the trails. 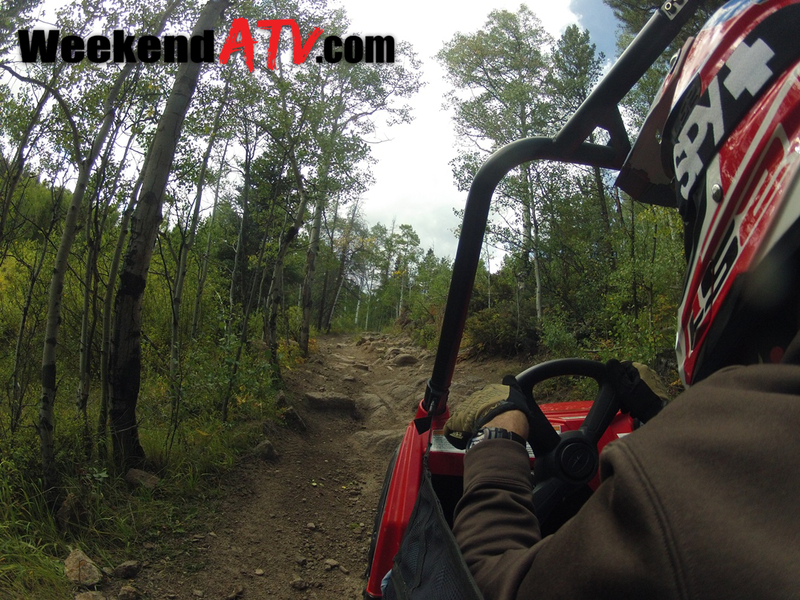 Boggs and Boulders is open for riding Friday through Sunday. 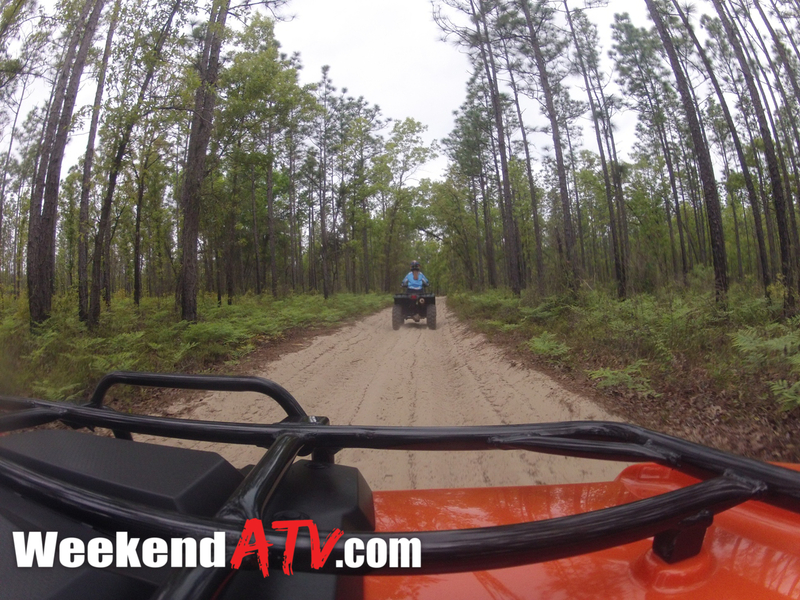 Rates during our visit were $25 per ORV plus $10 per person. Perhaps the best part of Boggs and Boulders is the atmosphere. 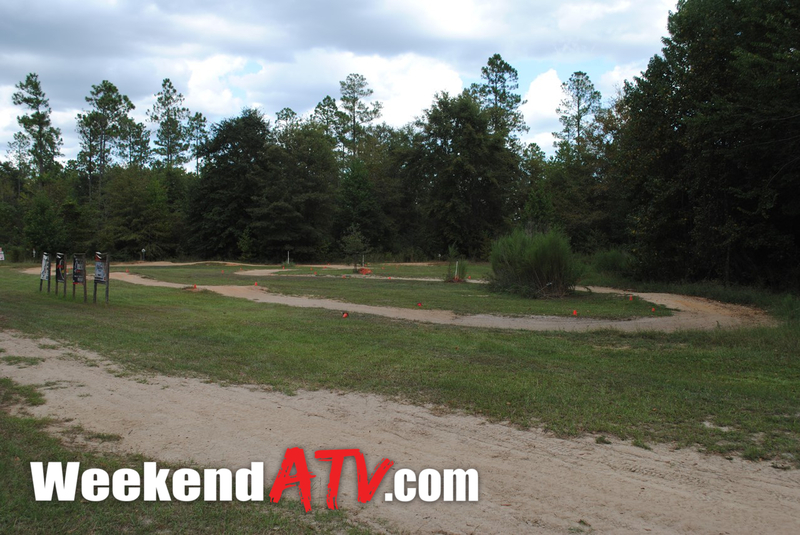 It is a very family friendly park and “Bogg Daddy” has plans to add even more enjoyment. The park rules are all very reasonable and promote good behavior. Helmets are required for youth and at some of the technical areas of the park. And while most ORVs are welcome, three-wheelers are not. To make your own plans to visit Boggs & Boulders check out their website at http://boggsandboulders.com. Attention County Commissions of North America: take note of the great efforts made by Cullman County. Cullman County is a moderately sized county between Birmingham and Huntsville, Alabama, and is perfectly divided by Interstate 65. 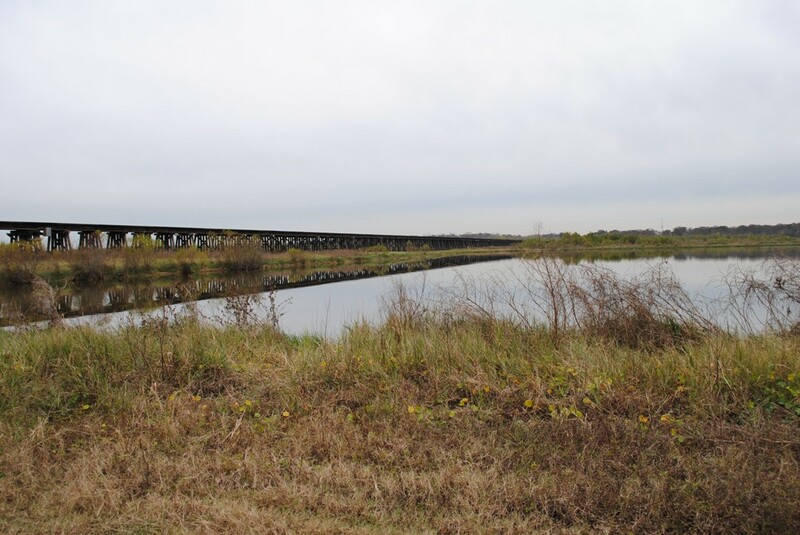 In 2007 the County Commission sought to increase tourist revenue, wanting to hold on to visitors who were stopping for little more than fuel and food as they passed through. 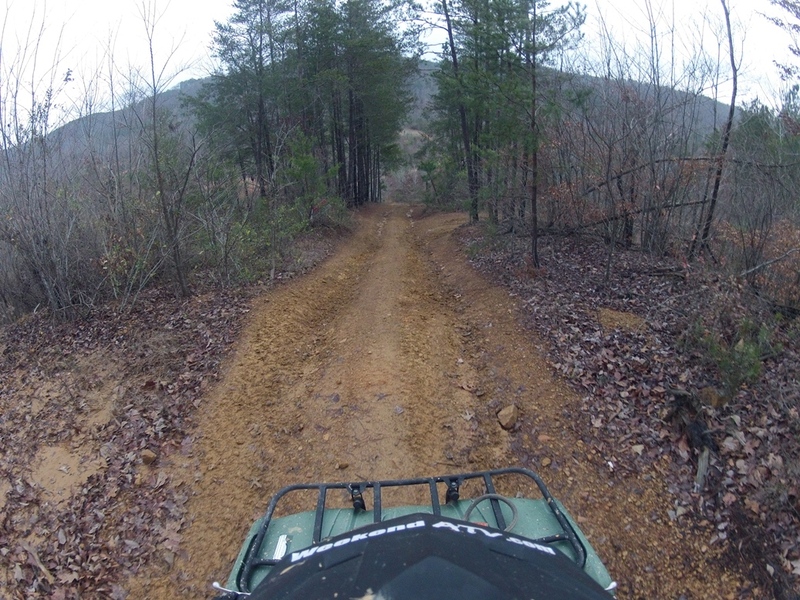 Enter Stony Lonesome OHV Park. 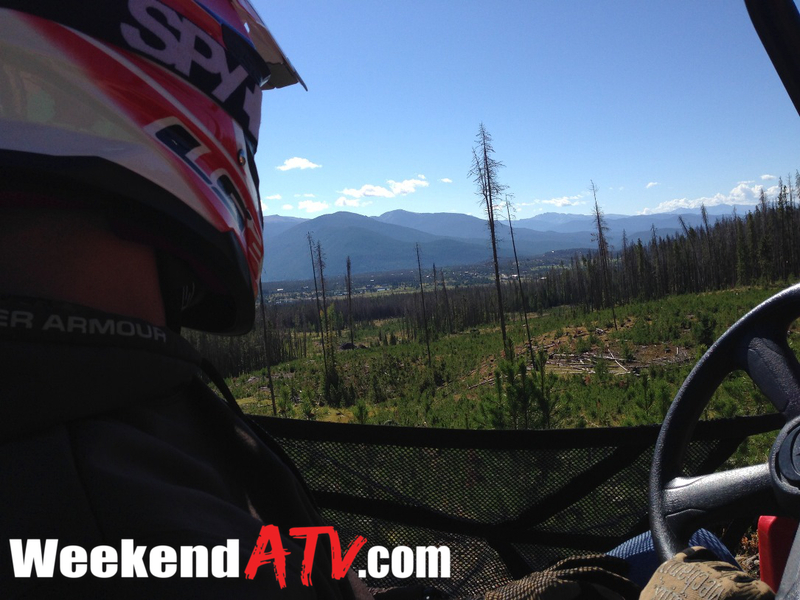 The county set 1,456 acres of land aside to become an OHV paradise. 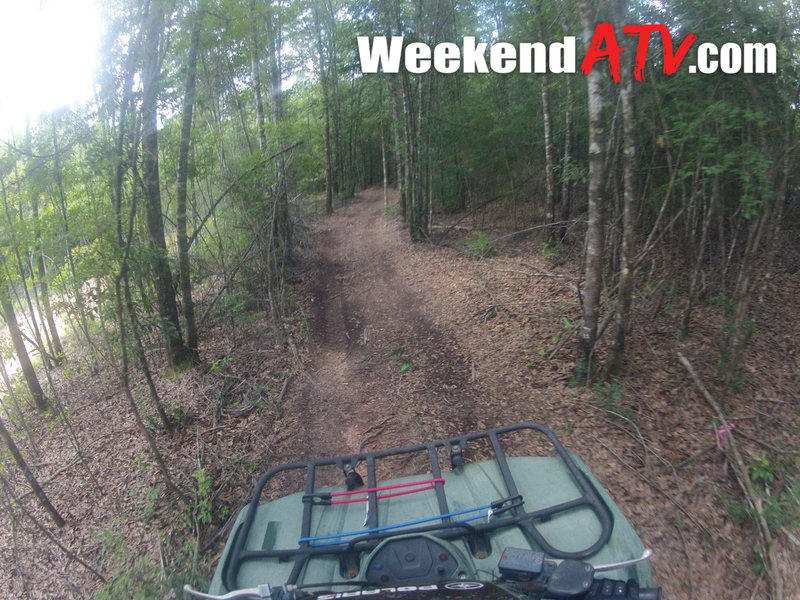 Today the park caters to ATVs, side-by-sides, Jeeps, rock crawlers, dirt bikes, horseback riding and even hikers.There are over 70 miles of trails, each rated and well-marked for difficulty, direction of travel and vehicle restrictions. The trails themselves are incredibly scenic, climbing through the foothills of the Appalachian mountains and along the banks of Dorsey and Stony Lonesome Creeks providing for some pretty steep climbs. 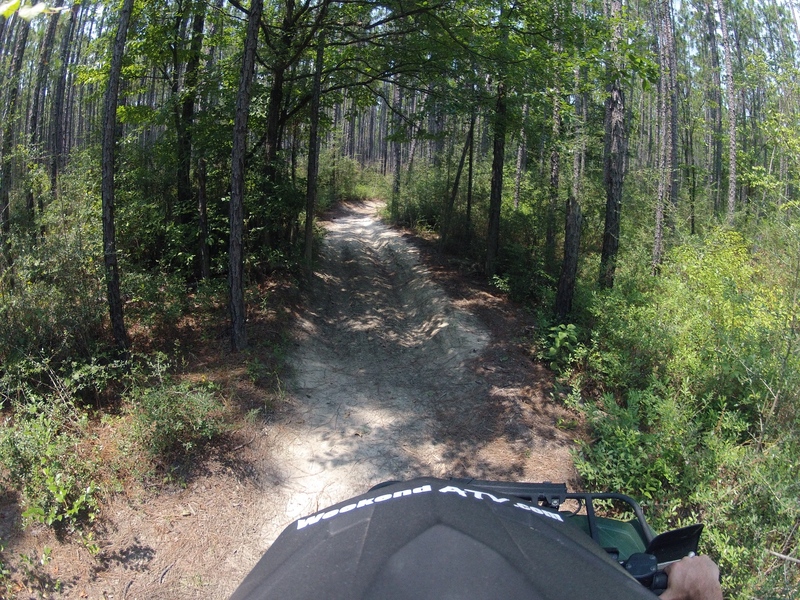 Trails are rated as Easiest, Advanced and Extreme. 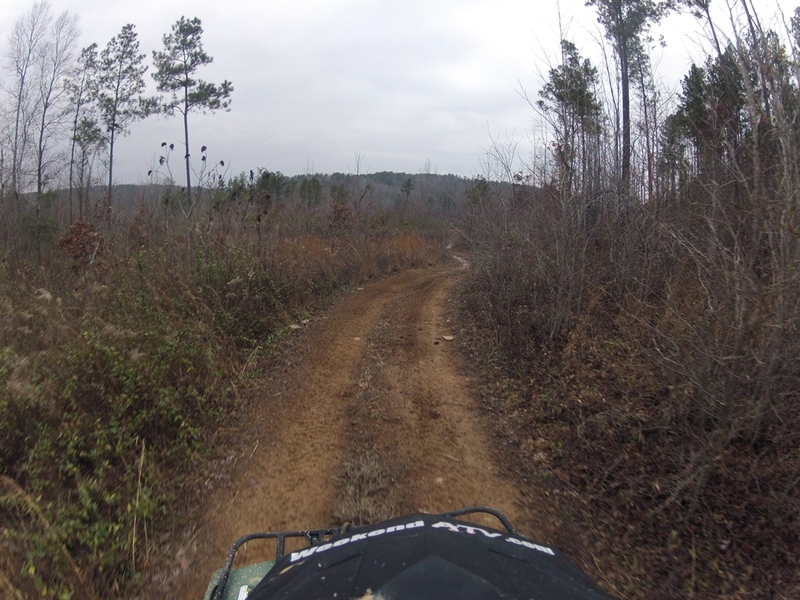 Each of the trails branch off from a couple of main roads that cut through the property. The main roads are two-way with one-way trails branching off. Most of the trails come back a few yards away. Throughout the park there are call boxes with map information. There are also a few helicopter landing zones, just in case. 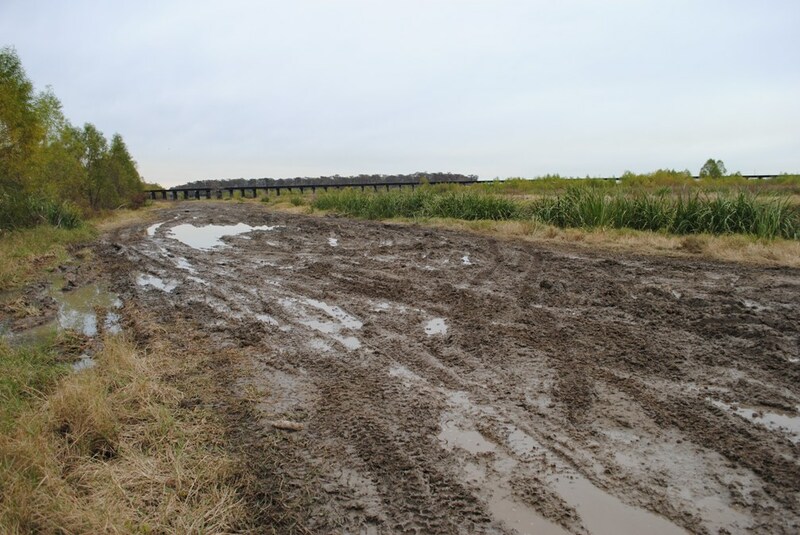 There are some muddy locations and even trails marked as being muddy, but don’t mistake Stony Lonesome for a mud park. 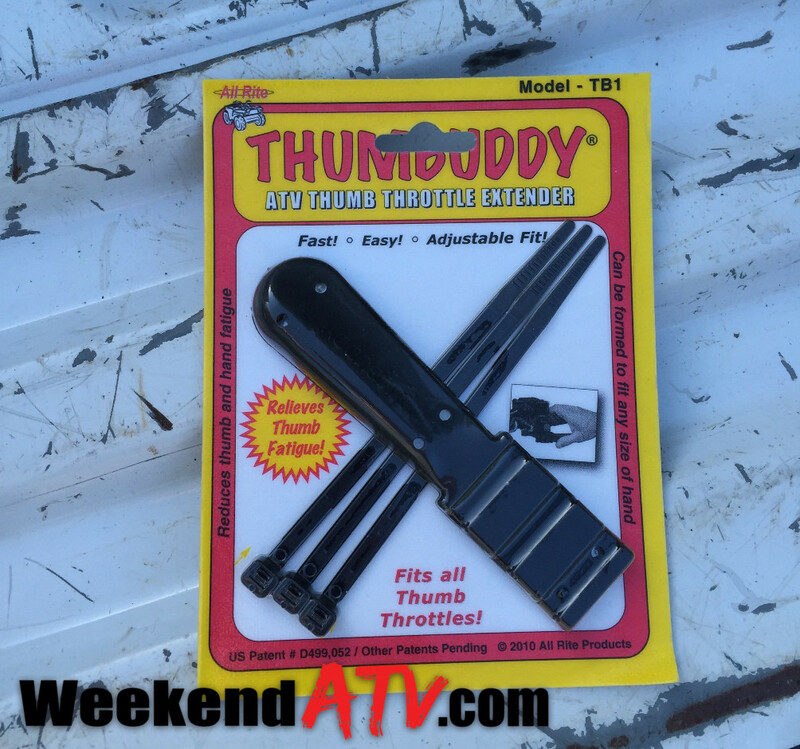 Even after heavy rain before our rides I only got water up to my foot pegs on a stock Grizzly 350 and only got stuck once when I bottomed out in ruts on an Advanced trail. 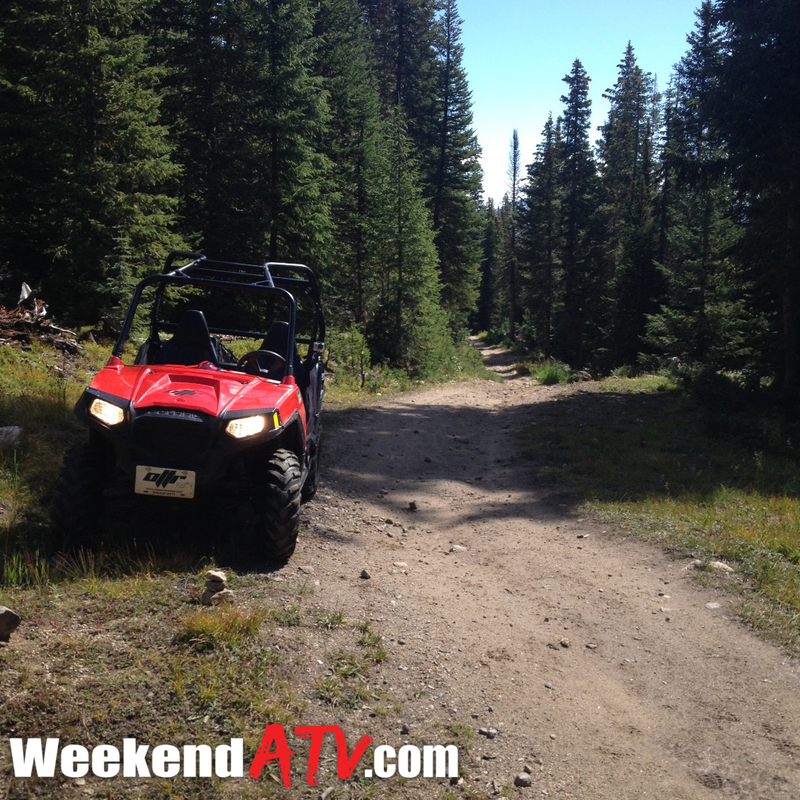 The Easiest trails are nice joy rides. 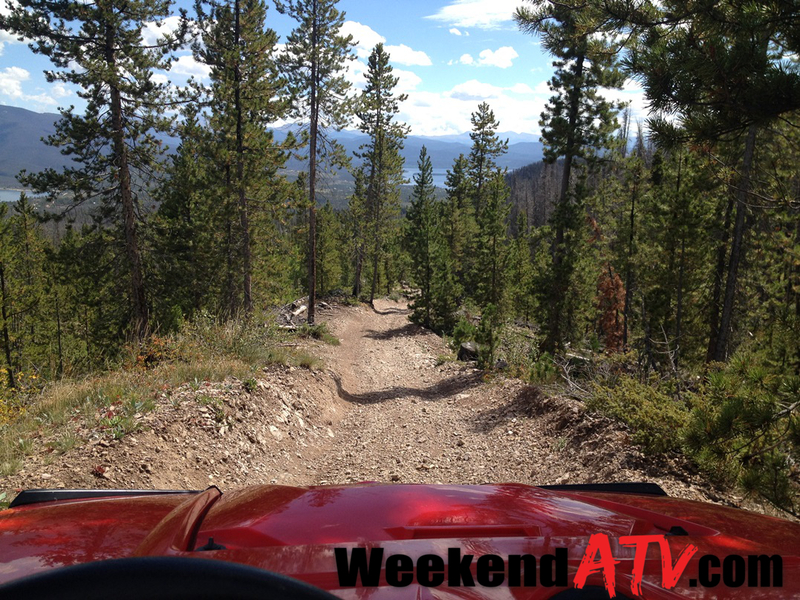 Advanced trails get into steeper climbs and deeper ruts, a trend that continues into the Extreme trails. Stony Lonesome has a nice park office on a hill overlooking the entrance. Check-in and check-out is required for all riders, including those staying overnight. No riding is allowed at night, ending an hour before dark. The park is open Thursday through Monday, closed on Tuesday and Wednesday. Quiet time starts at 10pm in the camping area. It’s a very social atmosphere until then. 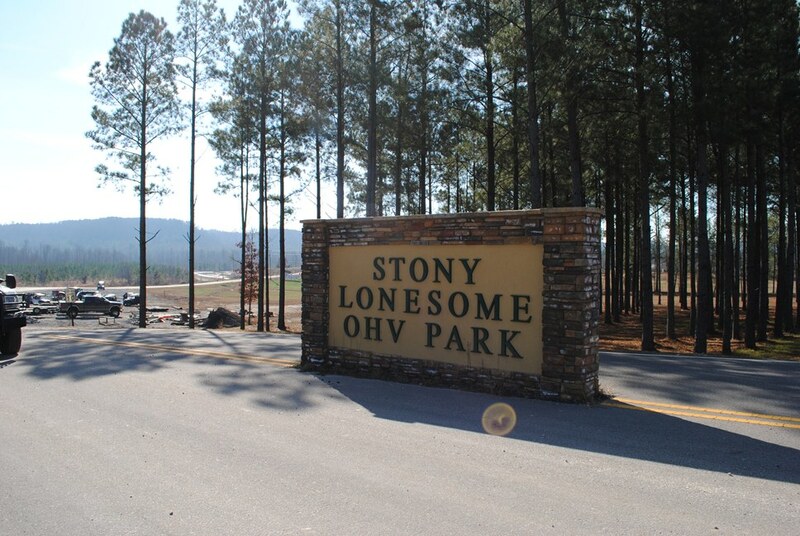 Like any respectable park, Stony Lonesome offers several lodging options including RV hookups and cabins. For $40 per night your cabin will sleep 4 and is equipped with a 3/4 bathroom, heating and A/C units, a microwave and a refrigerator. For $95 per night you can get a two bedroom unit with a dining room and a kitchen. A bathhouse is also located at the campground. 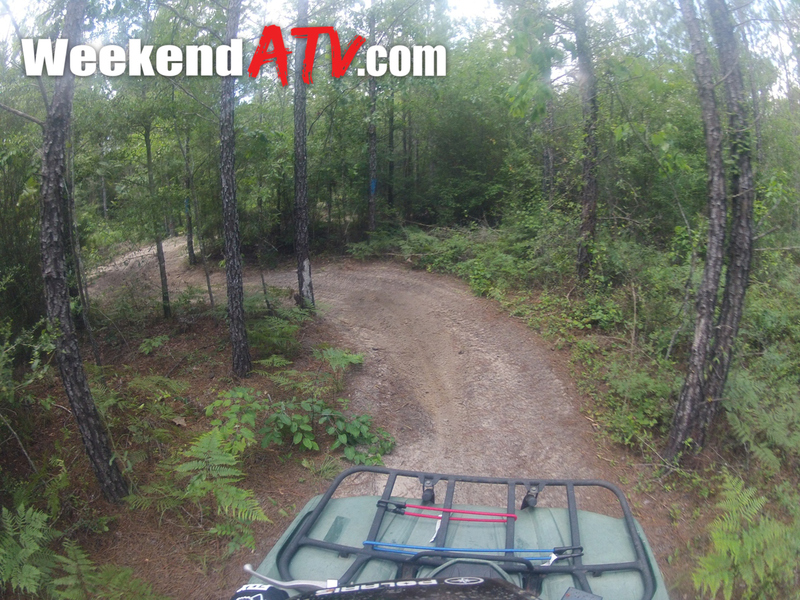 Also a bargain are the riding fees which are only $10 per day for motorized vehicles from dirt bikes to Jeeps. Additional riders are only $5 with those aged 5 and under riding for free. This makes Stony Lonesome half the price of many lesser parks! 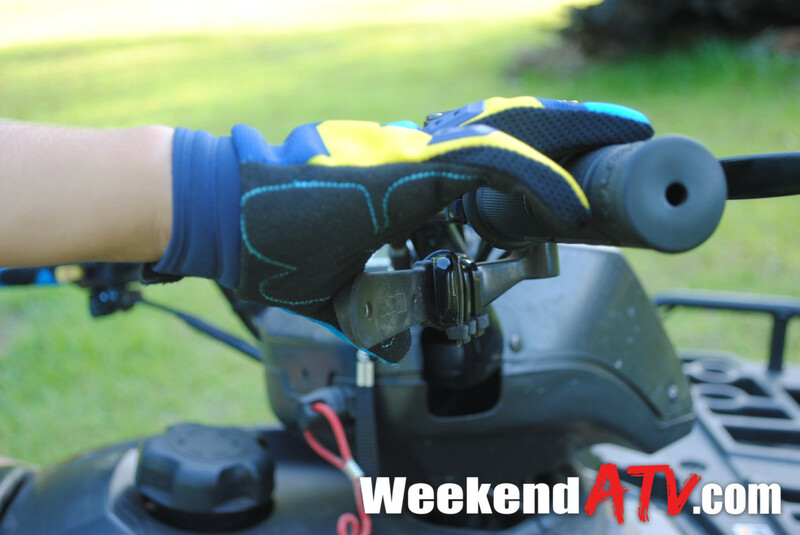 Helmets are required at all times on open motorized vehicles. They are available for sale or rent in the office. As for riding double they recommend you follow the manufacturers guidelines but there are no requirements, riding double is acceptable. Their office has wireless Internet access and a small eating area. Cell phone coverage was impressive throughout the park. Dodge City is at the I-65 exit and has fuel and a few eating options. Another 10 minutes north you’ll find the city of Cullman with most anything you could need. 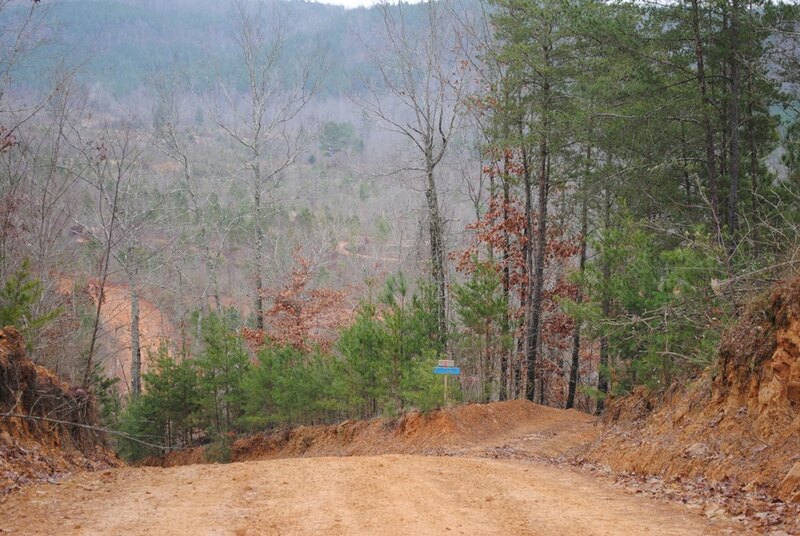 Like any riding trip call before you haul: 256.287.1133 . You can also visit them on the web at http://www.stonylonesomeohv.us/ and on Facebook at http://www.facebook.com/stonylonesomeohv. While you’re at it, call your county commission and tell them to check it out. If you build it, riders will come!